Politics & P2P: Benchmarking Browsers - How Does Opera 10.60 Stack Up? 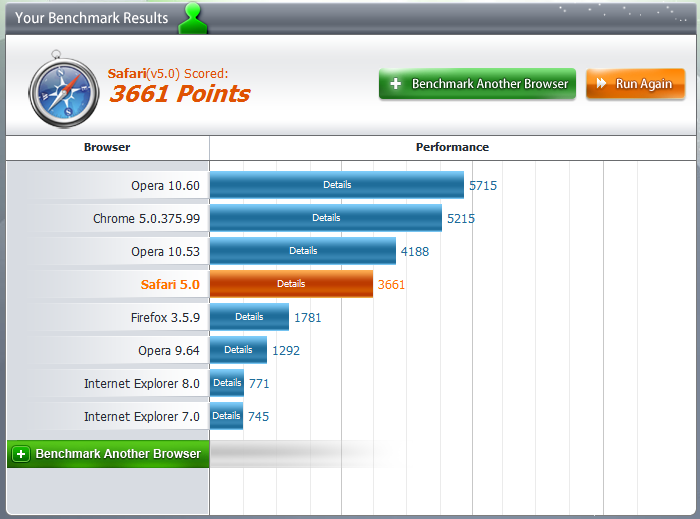 Benchmarking Browsers - How Does Opera 10.60 Stack Up? About a month ago, I did a bit of a browser comparison using my desktop and laptop. It gave some quite interesting results, showing just how far behind the two popular browsers, IE and FireFox, are behind. Chrome and Opera, on the other hand, have been making HUGE strides in speed, stability, and features, and since 10.60 has just come out, I thought I'd test it, and see how it stacks up. I also thought I'd install and throw in Safari 5, which was launched to great fanfare recently, claiming to be the fastest Does Opera 10.60 beat Chrome, or was the google-monster faster, and how did the all-seeing-Apple product fare? Find out after the jump. First, Let's look back on the old results, so we've got some comparison. For these tests, we'll be using the desktop system from last time, so let's first recap last month's PeaceKeeper results. As you can see, Opera 10.53 is about 10 points more this time, but it's roughly approximate, and IE7 and 8 are slightly lower. For some reason, Chrome's slowed down a little (or the tests have changed somewhat). It may also be that some things that increased speeds in some places, decreased them in others, or that added capabilities led to greater slowdown, and bug-fixes. The same goes for FireFox (changelog here). It would have been nice to have tested the older versions as well, to keep a growth metric, but alas, these two browsers automatically update themselves - while good for end-users, it's not so good in providing comparisons for benchmarks. These tests were all done on the same systems, with the same tasks running on each, so it's a fair comparison this time. 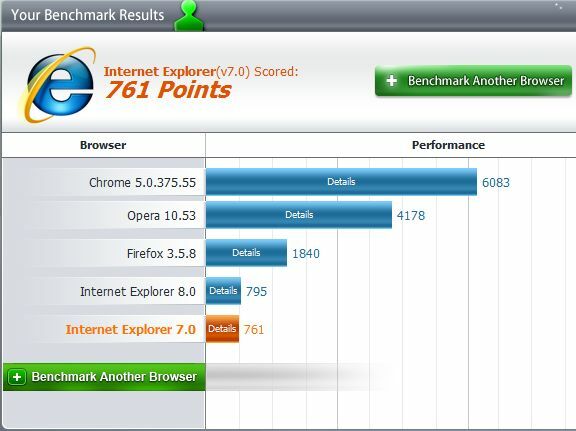 In the Peacekeeper benchmarks, Opera 10.60 has a fair advantage over Chrome, at present, while IE's aren't even as fast as Opera 9.64, which was released in March 2009 (IE 8 was released at around the same time, but while opera released Opera 10 in September 09, IE 9 won't be released until roughly September 2010). Incidentally, Safari, who also boasts on their website that they're the fastest, as this shows, it's not the fastest there. Here, as you can see, It's a close run thing between Opera 10.53 and it's successor 10.60, and Chrome 5 thanks to the EarleyBoyer test, (which Chrome dominated), the general consistency of Opera overall seems to indicate it's dominance over Chrome. Safari also made a good showing, being a reasonable distance back, but it's still behind Opera and Chrome. 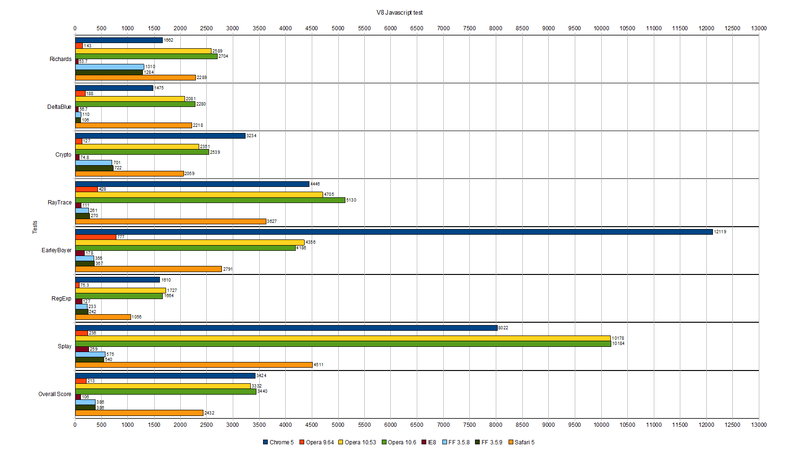 Firefox comes out barely ahead of Opera 9.64 and IE8, which is poor when you consider these are both browsers from March 2009, while Firefox 3.5.9 is from March 2010, a year later. 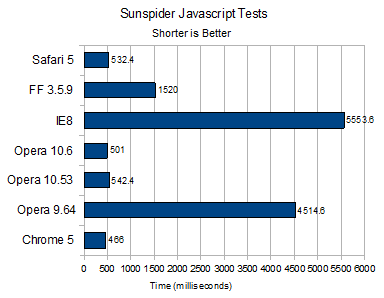 Finally, the SunSpider tests. This is a series of tests, which are run through 5 times. I'll give the overall times, click the links to get the detailed results (will open in a new tab). 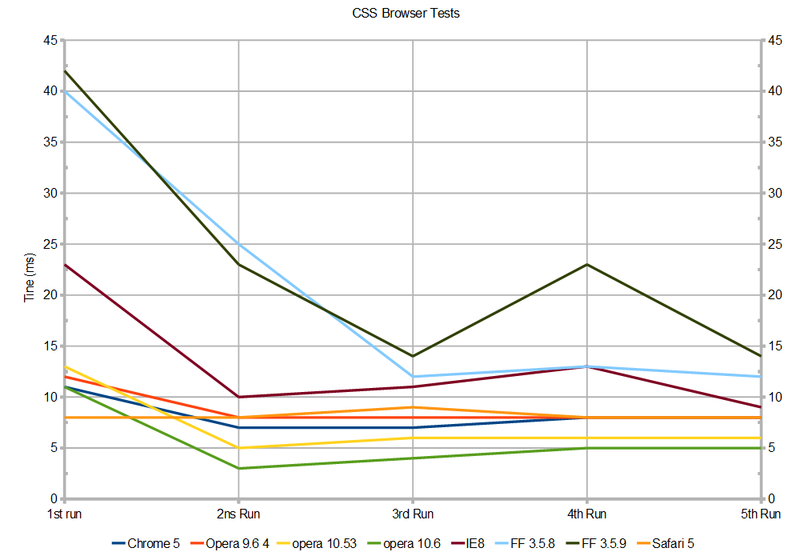 If the tests show anything, it's that there's not so much between Opera and Chrome performance-wise. I've been a long-time opera user, and I also use Chrome. a lot. That being said, Opera manages all this, AND has 'more' built in/included, whereas with Chrome, you need to go find add-ons. In the end, it's a personal-preference thing. Regardless, they're leaving the so-called 'smart choice' in the dust, and Apple is also lagging a little. The frantic pace with which Opera and Google are releasing new versions of their browser means they'll keep increasing their lead. Mozilla might be tossing out versions just as fast, but until they do a massive revamp of their code base, and spend some of the many millions they get each year in ad-revenue from Google on code development (rather than paying their CEO 1/2Million a year) the better they will be. At present, most of their new releases are bug and security fixes, for the hundreds of exploits and problems in their browser.